The story of the Higgins PT Boats cannot be separated from the story of Andrew Jackson Higgins and Higgins Industries. During WW2, the company built over 20,000 water craft for the US Navy, the Marines, and US Army and other allied naval forces. Although the design and manufacture of the landing craft, called “Higgins Boats” by the troops, was in no small measure responsible for the allies’ capacity for amphibious landings, crucial to the conduct of the war, Higgins and his company were involved in other activities as part of the “war effort”. Headquartered in New Orleans, with operations at several sites in the city and nearby towns, at its peak Higgins Industries employed over 20,000 people at seven locations. The importance of the Higgins Boat in the winning of the war led to the D-Day Museum, now the National WW2 Museum, being located in New Orleans. 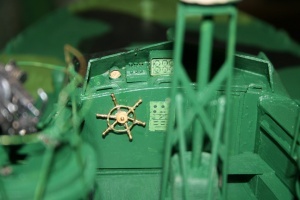 After I moved back to New Orleans, I decided I had to model a Higgins PT Boat. 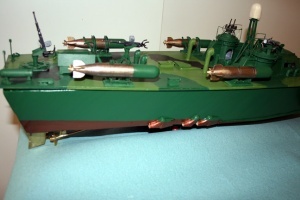 The first version, was one of the series of boats built in 1:32 scale, electric powered, RC controlled, with two decks, one with torpedo tubes (early) and one with roll off torpedoes (late). Higgins PT boats were built in three “classes”: The PT 71 class included PT 71 – 94 and PT 197 – 254; the PT 265 Class was PT 265 – 313 and PT 450 – 485; and the final class included the PT 625 – 660 boats. Other than changes in armament, the basic structure of the boats remained much the same throughout the war. 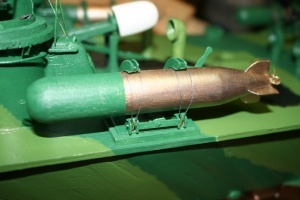 When the torpedo tubes were abandoned in favor of the roll off torpedo racks, the gun turrets on the Higgins boats were moved aft about 2 1/2 feet to improve cockpit visibility, and the cabin “wings” on each side filled in the resulting space between cabin and turrets. 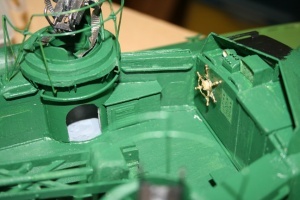 There were also changes in hatches and ventilation over time and improved instrumentation for navigation as well as the addition of radar in 1943 and later. 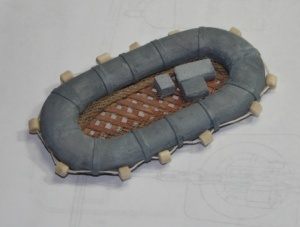 As a result of building the series of boats in 1:32 scale, I decided to build a model of an early Higgins boat in 1:16 scale. I thought the larger model would handle the wind and waves and hazards to navigation found in Bayou St. John, better than the smaller boats. I also thought it would be more fitting to have a Higgins PT model back in the Bayou, since the Bayou was where the Higgins PTs first were launched after construction of the hull at the City Park plant. The boats were loaded on railroad flatcars at the plant, moved by rail to the end of the Bayou, near the present day Lafitte Greenway where it crosses Jeff Davis Parkway, and moved by crane into the Bayou near its end at the Orleans Avenue Canal. From there, the boats were taken out the Bayou into Lake Ponchartrain around to the Industrial Canal to the main Higgins plant for fitting out and testing before being accepted by the Navy. 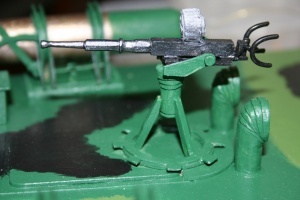 Here are some pictures of the 1:32 scale model. 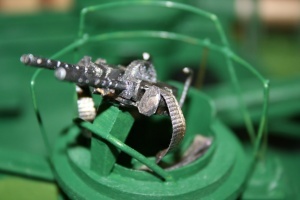 The larger model is featured in the construction Blog. This is the deck for the “early” Higgins. 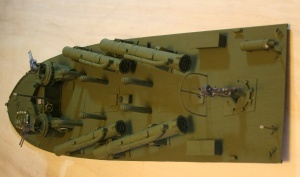 It is a generic boat of the PT 197 group of the PT 71 class showing the addition of the 20mm Oerlikon cannon on the aft deck. The boat still lacks even the early radar and has only a simple radio mast with masthead mooring light. Probably most or all of these actual boats would have been equipped with radar either upon final fitting out or in the field. This is the deck for the “later” Higgins. 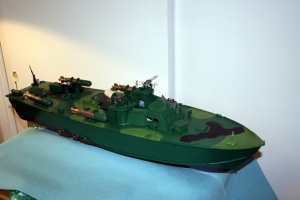 It is a boat of the PT 265 class and has roll off torpedoes, two 20 mm Oerlikon cannon, and the early type of radar, which made appearance in later 1943. Some detail photos of the late Higgins. This boat has the extended cabin with the turrets moved aft as described above.